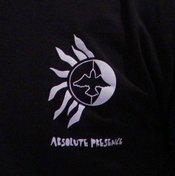 You may have seen a T-shirt or two with the words "Absolute Presence" surrounded by a logo of the sun, moon and a dove or read a note in the bulletin calling for a rehearsal time. What does it mean? Well.....According to Webster's Dictionary, "absolute" means ,"perfect, complete" and "presence" means "being present" or "immediate surroundings". In short, "Absolute Presence" is a musical group.....a band. This band has devoted itself and their ministry to music shared in immediate surroundings, at Mass, to worship God, who is perfect and complete. The name and logo were the inspiration of Angela Rubino, who was the female vocalist with the group when it was organized for the annual "Lock-In" in October, 2004, for the parish youth. A musical group had always been part of the lock-in events appearing at 12:00 a.m. (yes, that would be MIDNIGHT) to introduce new music to the teens and the youth leaders that would be used during the year. It was during the 2004 event that the musicians began to talk about doing this ministry on a more permanent basis. The band made their debut at the Lock-In 2005 ....at MIDNIGHT.... and is scheduled every few months to lead the music for the 10 a.m. Sunday Mass. Thecurrent members of Asolute Presence are Janet Rubino, piano and vocals; Tony Rubino, bass guitar, keyboards and vocals; Flipper Collins, drums and percussion; and Cheyloe Martin, rhythm and electric guitar and amazing vocals. The band uses songs from many resources during worship and has introduced several original songs from Janet Rubino's Demo CD, "Worthy Sparrow". Absolute Presence is hard at work rehearsing a repertoire of inspiring music. The group has brought a new sense of worship to the St. Patrick community at large and is welcomed by the parish family when they lead music at liturgy.